At the end of 2014, services offered by Bank Pocztowy were used by 1,432.3 thousand consumers, i.e. 8.2 thousand more than a year before. A small growth in their number has resulted from the introduction of an account maintenance fee for inactive holders of current accounts, which made them leave the Bank. Over 34% of consumers are elderly people. In 2014 Bank Pocztowy S.A. acquired over 218.7 thousand new consumers. A group of these individuals was acquired under a wider project of Poczta Polska, Bank Pocztowy and Zakład Ubezpieczeń Społecznych (Social Insurance Institution) encouraging elderly people to accept payments of social security benefits to a bank account. According to estimates, at the end of September 2014, Bank Pocztowy, with the share of 4.4%2, was seventh best on the market in terms of the number of consumers. The largest group of consumers (1,167 thousand) were current account holders. A current account is the key product used for acquiring consumers and the focal point in customer relationships. In order to win new clients, since September 2014, the Bank has introduced a new product, Konto ZawszeDarmowe, with free-of-charge maintenance guaranteed for an unlimited period of time. Konto ZawszeDarmowe has enjoyed significant popularity among clients: in the period from 15 September to 31 December 2014, the Bank opened 72,000 of such accounts. At the same time, Pocztowe Konto Standard was withdrawn from the Bank's offer, but the account for pensioners called Pocztowe Konto Nestor has been offered on a continuous basis. Further, the Bank offers two types of current accounts for microenterprises: Pocztowe Konto Firmowe and Firmowe Konto Oszczędnościowe. Product offer extended by Rynek + (18 M and 30m) with interest depending on market rates (WIBID 3M) increased by client’s margin. Pay by link Envelo program for remote clients, under which they are refunded 10% of costs incurred to buy Envelo products through pay by link functionality from their accounts held with Bank Pocztowy. Further, the Bank implemented a new edition of Aktywny Nestor program promoting active use of debit cards by elderly people. Aktywny Nestor offers refund up to 5% of expenses incurred in pharmacies. The program is dedicated for holders of Pocztowe Konto Nestor. PIT-based cash loans addressed to clients with employment contracts as an income source. The offer involved temporary acceptance of PIT issued by an employer as a document confirming the amount of generated income. An attractive loan consolidation offer aimed at winning clients indebted with other banks. Additionally, in order to improve the processing of consolidation loans, the Bank has revised and simplified its documentation requirements introducing an option to use a consolidation statement instead of the previously required agreements and repayment schedules regarding the consolidated loans. With regard to microenterprises, the Bank has implemented a new process of selling lending products offered both through Poczta Polska and its own network. Further, Bank Pocztowy has implemented a loan and deposit offer addressed to e-commerce segment clients along with a dedicated sales scenario. It offers its clients with bancassurance products in cooperation with insurance companies, to include: Pocztowe Towarzystwo Ubezpieczeń Wzajemnych, Aviva Towarzystwo Ubezpieczeń na Życie S.A., Grupa Ergo Hestia, Towarzystwo Ubezpieczeń Europa S.A. and Amplico Life S.A. Modification of the accidental insurance product involving an increase in the sum insured for each risk type and a growth in the base amount. Offering legal insurance products in the insurance outlet (the Bank’s website enabling the Bank’s clients to compare products and make a purchase). Extending the life insurance offer with Wsparcie dla Bliskich, offered to clients aged up to 85 with a different sum insured and premium amount. Introducing life insurance for mortgaged loan holders. Extending the offer with a package property insurance product protecting against a variety of risks depending on the selected option: option I is dedicated to elderly people who have retired, while option II is dedicated to people who are still working. The Bank has continued works to introduce the following products to the bancassurance offer: insurance package to the Standard and Nestor current accounts and assistance services. At the end of 2014 gross credit receivables of Bank Pocztowy from consumers totaled PLN 4,454.7 million versus PLN 4,165.2 million in December 2013 (a 7.0% increase). The Bank’s share in credit receivables from consumers of the banking sector amounted to 0.9%4. Source: management information of the Bank. The data present the principal amount only. Default interest, due and undue interest, commissions, other prepaid expenses and revenue, other restricted revenue and interest and other receivables were not included. 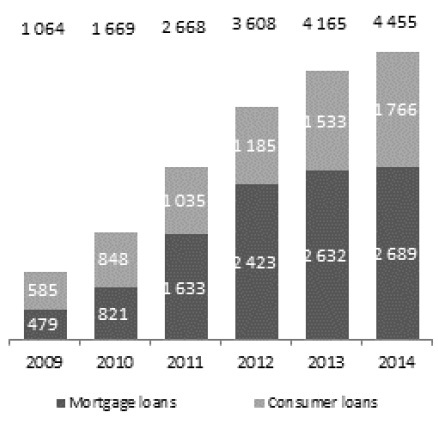 In 2014 the Bank dynamically acquired new consumer loans. 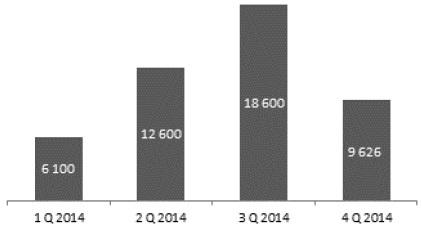 At the end of December 2014 receivables due to such products reached PLN 1,765.4 million, i.e. by 15.2% more than a year before. 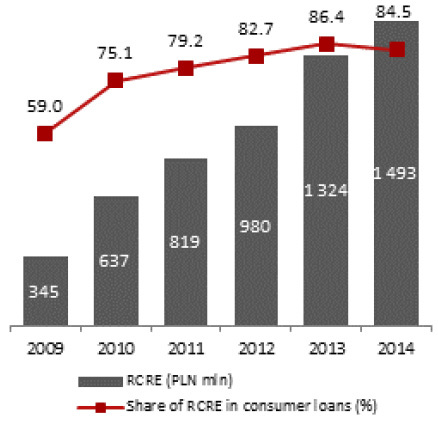 In 2013 the Bank sold consumer loans with the value of PLN 869.0 million. In the consumer loan portfolio the Bank focuses on low-risk facilities for Reduced Credit Risk Employers (RCRE), which constituted 84.5% of the entire portfolio in December 2014. Mortgage loans remain a large portion of the portfolio. As at 31 December 2014, the Bank’s receivables due to mortgage loans reached PLN 2,689.3 million and were by 2.2% higher than in December 2013. In 2014 the Bank, offering local currency loans only, extended PLN 204.6 million of mortgage loans, i.e. 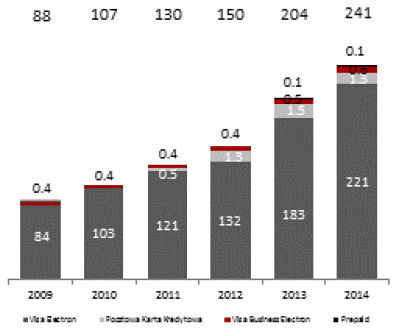 by 37.1% less than in 2013, when the sales reached PLN 325.4 million. The decrease resulted from the strategy followed. Due to limited capital, the Bank focuses on the sale of products with the highest profitability considering their effect on the capital, which implies promoting the sale of cash loans and stable sales of mortgage loans. Spółka Dystrybucyjna is at present the only distribution channel for mortgage loans. The key distribution channels are own sales network and the offices of Poczta Polska. Source: management information of the Bank. The data include only the principal balance, without accrued interest. 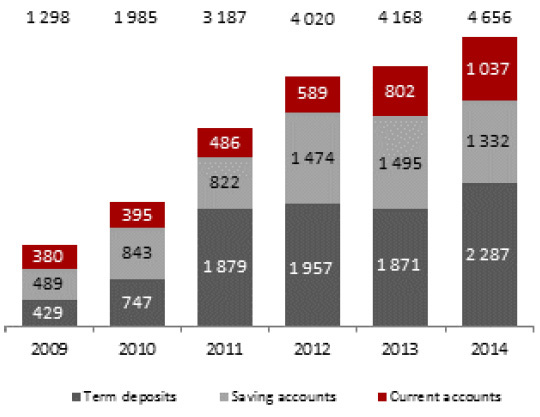 In 2014, the Bank focused on enhancing of a stable deposit base. At the end of December, term deposits of consumers reached PLN 2,286.7 million and were PLN 415.6 million higher than in December 2013. Thanks to an offer including attractive products, in December 2014 the Bank collected PLN 628.6 million in the form of long-term deposits compared to PLN 616.0 million in December 2013. In 2014, the balance of cash on consumer current accounts increased as well, to reach PLN 1,036.8 million at the end of December 2014 (29.2% more than in December 2013). At the end of December 2014 Bank Pocztowy managed 997.4 thousand current accounts of consumers and microenterprises. Following a decrease in interest rates, clients were less interested in saving accounts, whose interest dropped from 2.2% at the end of 2013 to 1.7% in December 2014. Funds collected on saving accounts at the end of December 2014 amounted to PLN 1,332.6 million and were PLN 161.9 million lower than at the end of 2013. In December 2014, 65.6% of funds deposited with Bank Pocztowy came from consumers and were collected through Poczta Polska network, exceeding the closing balance of 2013 by 2.0 p.p. Aiming at extension of offer for consumers, in 2014 the Bank focused on investment product strategy. In March 2014 the Bank decided to get involved in sales of investment fund participation units. As a result of a procedure performed, the Bank selected Ipopema Towarzystwo Funduszy Inwestycyjnych as its strategic partner to supply the Bank and Poczta Polska network with an investment fund offer and then to build white label funds under the Bank’s brand. 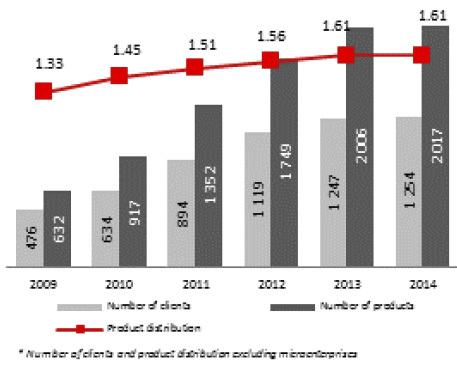 At the same time, the Bank developed its selling and processing competencies regarding sales of structured products (Światowi Giganci structure) and unit-linked insurance (Złote Jutro) preparing the sales network and clients for the next step in development of its investment product offer to include commencing sales of investment fund participation units early in 2015. Debit cards. In 2014 the Bank continued with the key components of the offer, i.e. eliminating the fee for the card upon conclusion of card transaction for PLN 200 for Nestor account and PLN 300 for ZawszeDarmowe and Standard accounts. 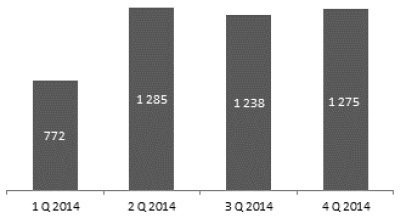 As a result, in 2014 the value of non-cash debit card transactions concluded by the Bank’s clients doubled. Also, the value of cash transactions on debit cards grew nearly twice. The number of actively used debit cards also increased by 44,000 year to year. Aiming at further increase in the use of cards, the Bank introduced an option to buy a monthly prescription allowing charge-free cash payment from all ATMs around the world. MasterCard debit cards introduced in December 2014 allow clients concluding transactions through Internet and on the phone. Postal Credit Cards. In September 2014 the Bank introduced two new credit card images dedicated to all new clients: a white card and a black card. 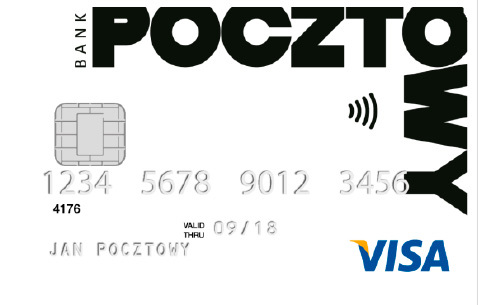 By the end of December 2014 Bank Pocztowy S.A. issued 241.2 thousand payment cards for consumers (i.e. 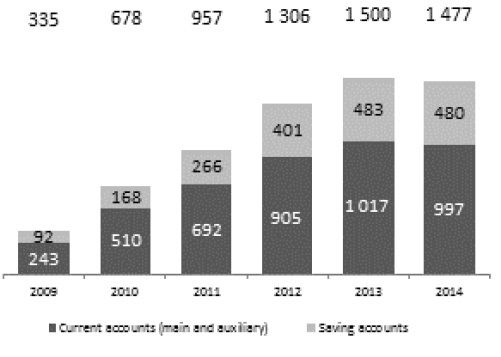 by 18.3% more than at the end of 2013), including 221.2 thousand debit cards (i.e. by 21% more than a year before) and 12.7 thousand credit cards. 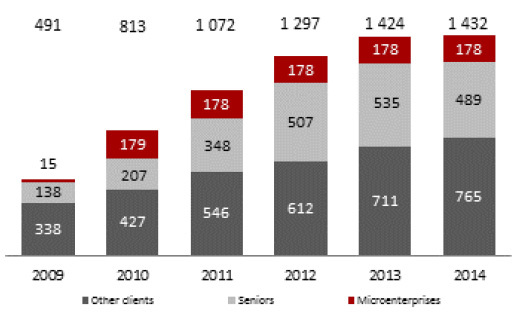 1 In 2014 the microenterprise segment was moved from institutional banking to retail banking. At present, retail banking has included consumers and microenterprises. All financial data for previous years have been brought to comparability in accordance with the current segmentation. 2 Source: PRNews.pl Number of clients in banks, Q3 2014, 9 December 2014. 3 Reduced Credit Risk Employers include: the Police, city authorities, fire stations, public healthcare units, companies listed at the WSE and companies from the Poczta Polska Capital Group. 4 Source: WEBIS data for Bank Pocztowy, data of the National Bank of Poland for Monetary receivables and liabilities of financial institutions, December 2014 for the banking sector. 5 Source: WEBIS data for Bank Pocztowy, data of the National Bank of Poland for Monetary receivables and liabilities of financial institutions, December 2014 for the banking sector.